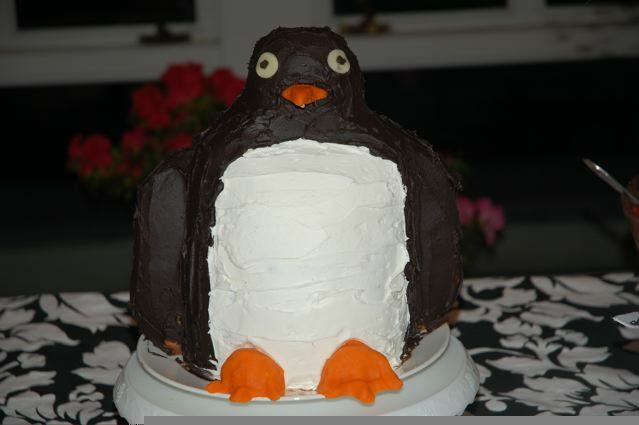 Front view of penguin cake. Above is a 3D cake I made in 2009. This cute penguin cake was the hit of the party! A quick description of my project: The penguin cake required 6 round cakes for the body and wings and half of a pound cake for the head. I used a chocolate buttercream crumb coat and a buttercream frosting, and I decorated the penguin cake's beak, eyes and feet with marzipan. This cake did not require structural reinforcement aside from skewers to secure the wings to the body. Below, I share the cake decorating tips I found so that you can also learn how to make a 3D cake at home. The best cake recipes for making a 3D cake are those that result in the sturdiest cakes; they will hold more weight and your 3D cake will require less additional reinforcement. Cake recipes with higher protein content tend to be firmer as do those with a denser crumb and less air in the final cake. If you are making a cake recipe from scratch, you can reduce the air in the cake by reducing the leavening (baking powder and baking soda) and the amount of time you cream the sugar and butter (because creaming traps air pockets in the dough that grow when they heat up during baking). Finally, you can increase the protein in any cake recipe by substituting some of the all-purpose flour for bread flour. If you'd like to save time by using a cake mix recipe for your 3D cake, there are ways you can modify it to make the resulting cake denser and firmer. The two most common approaches are to add an extra egg white and an instant pudding mix to the cake mix. However, there's no need to experiment blindly; the internet should be able to provide a handful of tried-and-tested recipe and cake mix modifications. As a last resort, you can also purchase pre-made dense pound cakes from your local grocery store. These dense cakes are great for 3D cake carving. For the penguin cake above, I used both my own homemade cake recipe and a store-bought pound cake. Depending on the size of your 3D cake, you may need to add reinforcements to prevent the upper layers from crushing the lower layers. A good at-home approach is to use food-safe cardboard (cardboard cake rounds are one option) between the cake layers. If you can't find food-safe cardboard, you can cover clean cardboard with foil, parchment paper or wax paper. Use bamboo chopsticks or skewers cut to size to support each cake level between the cardboard layers. To visualize this approach, imagine a cardboard and bamboo table pressed into each layer of your 3D cake. Each layer which needs reinforcement is protected by its own table. The amount of reinforcement your cake will require depends on your cake design and the strength of your cake recipe. As a reference point, the penguin cake I made did not require any additional reinforcements, though I did use bamboo skewers to attach the wings. No matter which frosting recipe you choose to finish the 3D cake with, you will want to begin with a thin undercoating of frosting, also known as a "crumb coat." A simple buttercream frosting works best for this cake decorating step. Apply a thin layer of the crumb coat over the cake after you've finished sculpting and allow it to set. This seals the cake, preventing cake crumbs from mixing into your finished frosting layer. Word of warning: a store-bought frosting will stay moist instead of setting, and will not do as good of a job for this stage of the 3D cake decorating. For finishing the cake, the two most common options are fondant and buttercream frosting. Buttercream frosting is easy to make at home, but does not provide the same flawless outer layer that fondant does, and it cannot be sculpted. Fondant has a consistency similar to play-doh and provides a very smooth and consistent finish. You must rolled it out before applying it carefully to the cake surface. You can also sculpt it to add ornamentation. It can, however, be difficult to make at home, expensive to buy pre-made, and hard to work with. I have tried making an alternative to fondant called "marshmallow fondant," but would not recommend this route: the resulting product is stretchy, difficult to cut, and tastes like marshmallows. Once you've added the basic frosting your 3D cake requires, you can add sculpted details with additional fondant or marzipan. You can also make frosting roses and other intricate frosting designs by piping buttercream frosting onto the cake with a cake decorating tool with tips and the help of a flower nail and specialized petal and leaf decorating tips. You can find professional gel food coloring at a baking store or online. Professional dyes have the benefit of coming in a wide variety of colors. (Professional food coloring was essential when I made the penguin cake because I needed a pure black food dye.) They are also quite thick, making them less likely to alter the consistency of your fondant or frosting, even when you add a large amount to the recipe. Common household food dye is much easier to find, though there are fewer colors to choose from. Add household food dye carefully if you choose to use it and keep an eye on the consistency of your frosting or fondant. For basic 3D cake designs, you can stack the cakes first and then carve them freehand with a bread knife and paring knife. Use frosting as glue between the layers if it is needed. This was my approach with the penguin cake, and it was a fairly straightforward and low-stress approach. For more complex designs, however, it can help to draft a plan in advance. On paper, draw the outline of each cake layer at the desired final dimensions. Then, place each sheet of paper over a cake layer and make the cuts needed prior to stacking. You can then stack or arrange the layers to assemble the final sculpture. Another approach that can help you plan a complex 3D cake is to model the desired cake sculpture with clay. You can slice the clay cake sculpture at the correct intervals to determine the size and shape that each cake layer must ultimately be. Hopefully this will help a few of you get started on a 3D penguin cake or other 3D cake of your own! Feel free to reach out to me with any questions, and I'll do my best to answer. Do you recommend freezing the layers before stacking and frosting them? I've never tried it myself, but I've heard that this is a good method. Freezing your layers overnight should help the layers stand up to carving, be less likely to break while being moved, and should reduce the amount of crumbs that end up in your crumb coat. Carve and crumb-coat the cake while it is still frozen if possible, and use a bread knife for best results. Good Luck!